I used to be a good sprinter at school and almost joined a running club but that soon ended with various distractions after leaving. I got back into running when I met Annette about 13 years ago. She was a runner long before me and one day I watched her run the Great South run, the year after I decided to give it a go and got hooked. I can’t imagine not being a runner or having something to do with the sport. Simply because I enjoy running, But It helps when stressed or feeling down, I like going to new places and seeing new things so running also fulfils my need for adventure. The race that has the most memories both good and bad is the Great south run, this was my first race in 2007 with little training and shoes that were a size to small. Only my stubbornness got me to the end but with injury. I learnt a lot that day and now know training is very important and make sure you wear the correct kit. I have run the GSR many times since in all kind of terrible weather and even once completely exhausted from doing Tough Mudder the day before but my favourite one was 2018 with a large harassment of harriers (collective noun), perfect weather and a new PB by 8mins from my previous in 2013. Before joining the club probably Mario Mola (triathlete) Always smiling and overall nice guy, Sub 30 min 10k after swimming 1.5k and cycling 40k is impressive. Since joining the club, I think most members inspire me in some way. Whether you a beginner doing your first parkrun, coming to track for the first time or coming all the time giving it 100% and still smiling at the end. Those doing crazy 100+ mile Ultras, anyone racing cross country or MABAC league races and everyone doing their first marathon this year. Sometimes as a more experienced runner we forget (or try to) how hard it was doing our first 5k, 10k or half. Kudos to you all. The obvious one I have never done would be London marathon but depending on how I feel after my first ultra in June I would like to be able to try NDW50 or SDW50 in a few years’ time. Try something new/different maybe track or hill session, longer distances, a new parkrun, cross country, race against a train or horse (yes this is actually a race you can do), try a triathlon, do a relay or just get the map out pick a place and see if you can run there. There are so many different ways to enjoy running. I have entered lot of races the first half of the year but most of them are for fun or training races. The 2 big ones for me are Brighton marathon in April which I would like to get a at least a PB and possibly a sub 4hr and Race to the Tower in June which is my big challenge for 2019 and the furthest I have ever run. 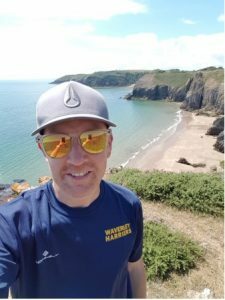 Why did you Join a running club and the Waverley Harriers? Initially joined only because I wanted to use the track to improve my speed which it has but soon realised how welcoming and friendly everyone was, I have made many new friends within the club and also socially when not in my running kit. The club has also introduced me to Cross country racing which I now really enjoy.